Ontos: "There Is Even a Twist at the End, As If There Were Anything Left to Twist"
"There Is Even a Twist at the End, As If There Were Anything Left to Twist"
Here are reviews of most of the works of one of the most enigmatic figures in the detective fiction genre, A. 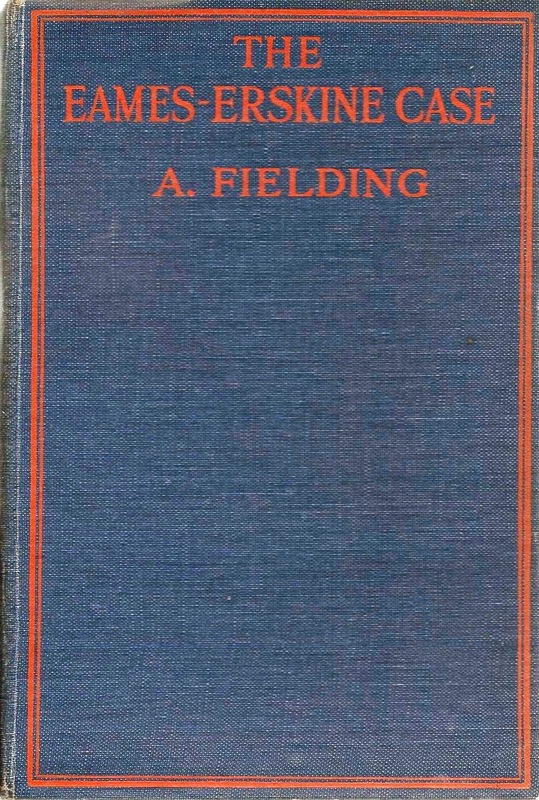 Fielding (for more background information about this author, see the MYSTERY*FILE and Curt Evans articles in "Resources," below). The general critical consensus: Fielding could run hot, lukewarm, or cold, but usually it was the last two. W. Collins & Son & A. L. Burt. 1924 (US: 1925). 277 pages (US: 244 pages). [Review excerpts] . . . 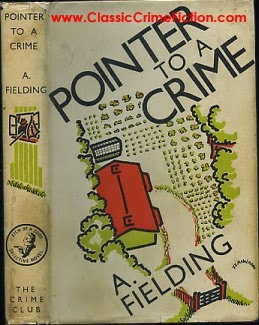 Although Fielding doesn't depend on a Crofts specialty–detailed alibis, often involving train timetables—there is much painstaking investigation by her policemen, in the Crofts manner. 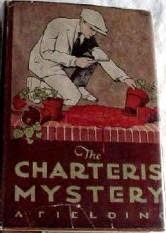 THE CHARTERIS MYSTERY: A POINTER PROBLEM. 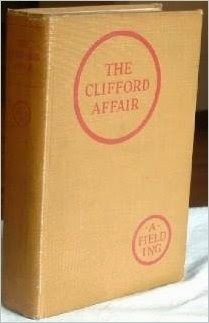 [Full review] Here is a detective story in the grand manner, with a Great Detective sprinkling yellow powder about and looking for finger-prints, twelve or thirteen characters who can't explain any of their actions, a beautiful girl who just won't believe her Philip is guilty, and a villain willing to go to any amount of trouble and expense to murder people. [Full review] Those who wish for a sound night's rest should not begin Mr. A. Fielding's 'The Footsteps That Stopped' in the evening, for they assuredly will sit up until day-break to learn the truth concerning Mrs. Tangye's death. Chief Inspector Pointer pieces apparently trifling scraps of evidence together after the fashion of a mosaicist, until he brings into being a truthful picture of what really happened in the morning-room. And the reality is far from what the most suspicious reader will conjecture, although he may—and most certainly will—conjecture a round dozen of times. [Full review] After a ball at a villa on the outskirts of the sleepy town of Cluny, famous for its monastic ruins, two English guests, one of them a famous financier, are found, locked in one room, dead, with pistols beside them. The swarm of detectives, English and French, official and private, who descend upon the scene, are soon forced to reject the obvious conclusion of a duel; but though they unearth many strange goings-on at the Villa Porte Bonheur, and much of the secret past of the principals in the tragedy, it is not until Inspector Pointer of Scotland Yard sums up in the last chapter that the pieces in the puzzle fall together. THE NET AROUND JOAN INGILBY. [Full review] Farthing was one of the oldest houses in England. And under its roof were Edgard Danford, the owner; his wife, his brother and his stepdaughter; his estate agent, Rivers; his business partner and a number of other less important people—when there rang through the drawing-room the ghastly, ghostly laugh the third repetition of which always shortly preceded the death of a member of the family. Knowing this, it will not startle you to find the unfortunate Danford dead, strangled in his bed, a few mornings later. 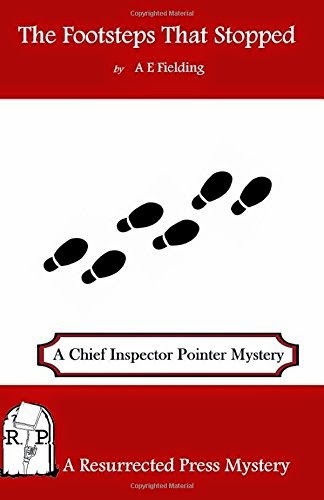 Whereupon our old friend Inspector Pointer, gets busy and untangles a very complicated mystery. A little long, but otherwise excellent, and credible everywhere but on page 246 where the heroine strokes the scorched cheek of a gentleman who has just been rescued from a burning house. True, he loved her, but we believe he'd have yelled just the same. [Full review] A rather turgid, slow-moving thriller in which a prominent member of the bar is murdered and Pointer of Scotland Yard investigates. [Excerpts] . . . The clues take the clever Inspector Pointer to various London locations and eventually to a casino on the continent, but it is a small out-of-the-way cottage that reveals another corpse and an exciting finish, where Pointer must knock out a disguised murderer before a third life is lost. . . .
. . . as I progressed through the pages, I found myself quite charmed by the writing. I like to read mysteries of this vintage as much for their explication of the social background of their period as for the puzzle, and I found myself interested in both. The puzzle aspects are frequent and enigmatic. . . .
. . . Other commentators have remarked that Fielding is a sloppy writer who will sacrifice a lot of believability for the sake of a tricky and surprising ending. 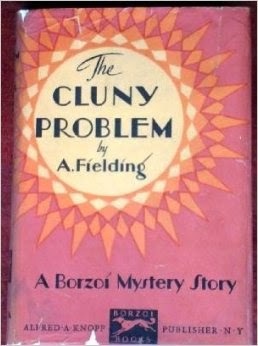 I have to say that although I have noticed sloppy writing in a couple of other Fielding novels that I’ve read recently, courtesy of Hathi Trust, this one didn’t especially annoy me at any particular point. . . .
. . . I was certainly surprised by the ending, and that is not an experience I have often with detective fiction … the identity of the murderer was actually a surprise to me, and I felt instinctively a rather fair one. . . . THE CASE OF THE MISSING DIARY. 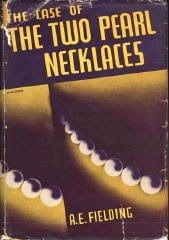 THE CASE OF THE TWO PEARL NECKLACES. [Full review] A wealthy young man, against his father's wishes, marries a woman who is not of the right class. As a wedding gift he gives her two pearl necklaces said to have been owned by Queen Charlotte and thought to be unlucky. Shortly after they return from their honeymoon she is murdered. The Scotland Yard detective in charge of the case allows both the young woman's husband and the private agent he hired to be quite involved in the case. [Full review] I really enjoyed this one—and a new to me author, too. The upright, much-loved rector of a country parish is murdered not long after delivering perhaps the finest sermon of his life. By chance a Scotland Yard detective is staying with the Chief Constable and finds himself called upon to investigate the murder. The detective is something of a cipher and rather too good to be true—he is intelligent, well-read, enjoys active pursuits such as rock climbing, knows about art, in short a fairly typical detective of the time (which is definitely sometime in the 30's). 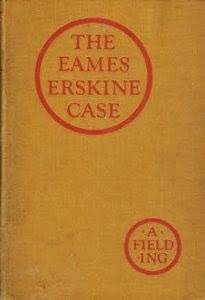 The characters are fairly standard for the time—a wealthy young man (or two), a scheming woman (or three), the vicar's spinster sister, various well-trained servants, a local police superintendent (not too bright but not too stupid), and a Chief Constable who is rather involved in the investigation. - The GAD Wiki page about Fielding is HERE, while a comprehensively researched page about this author is HERE. 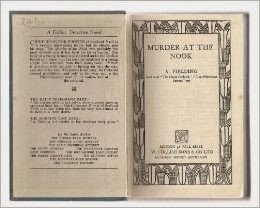 - Curt Evans's overview of Fielding's works is HERE. - Jon Jermey has still more HERE.